Discussion and Science Journal – What do you know about your 5 senses? Why do we have them? In what ways might they be useful in science? Extension: Describe an item using their senses and see if a peer is able to identify the item. 1. Hook: Wear a lab coat and bring in a magnifying glass. Explain to the students that you have a mystery item in your box. They may ask questions (in relation to their senses) that might help them identify the mystery item. Extension: Continue Activity – Describe an item using their senses & see if a peer is able to identify the item. 1. Hook: Write down the word MATTER as you would setup an Acrostic Poem. Have the students write down as much as they can about the word matter – with each sentence starting with a letter from the word MATTER. Extensions: Inquire: How does matter change in different parts of the universe? Lessons 4 - Are These Matter? Predict if item is made of matter using prior knowledge. Test: Does the item take up space? Does the item have mass? Collect simple data in the form of observations. Write down your inference to answer: Is the item made of matter? *Discuss the concept of energy. Depth of the conversation may relate to whether the Gr 4 Science Big Idea on energy (Energy comes in a variety of forms that can be transferred from one object to another) has been studied prior to or after this unit. ELL/Adaptations: Use visuals, simple words, or scribe for the Frayer Model or adapt it to only include some components: Operational Definition & Characteristics. Extensions: Continue Inquiry: How does matter change in different parts of the universe? 1. Hook: Is it Matter? Provide students with a list of items and have them check-off the items that they believe are examples of matter. Have them write the ‘rule’ or reason that helps them decide whether something is or is not matter. ELL/Adaptations: Provide hands-on objects or visuals for which it is easier to recognize the pattern. Extensions: Inquire: What could happen if a material could be in two states at the same time? 1. Hook: Watch Matter Chatter. 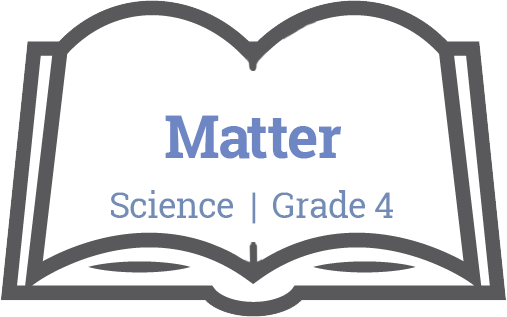 Discuss how the connections are made between observations, matter, and three states of matter. ELL/Adaptations: Students choice (visuals, oral, etc.) to complete exit slip. Extensions: Inquire: Are there more than three states of matter? What are the other examples of items that also exist in three states? (These students might want to inquire into this portion sooner, so they can help the class to better understand the concept for the Exit Slip). 1. Hook: Show the class a melted chocolate bar. Ask the students: What state is this chocolate bar in? What are the states that chocolate can exist in? ELL/Adaptations: Student choice (visuals, oral, etc.) to complete exit slip. Extensions: Inquiry: Prove that matter can change directly from solid to gas or gas to solid? ELL/Adaptations: For the audio-visual learners, to help students better understand how changes can happen in states of matter, students can watch: Bill Nye the Science Guy S01E07: Water Cycle. Extensions: Further inquiry into what role do energy and matter play in the universe? 1. Hook: Watch Bill Nye the Science Guy S01E08: Phases of Matter. ELL/Adaptations: For the audio-visual learners, to help students better understand how changes can happen in states of matter, students can watch: Bill Nye the Science Guy S01E07: Water Cycle. Students can also have the diagram of the water cycle to label and use to explain their understanding. Extensions: Inquire: Does the effect of temperature differ for different items? 1. Hook: Tell students they will be making ice cream today. ELL/Adaptations: Students might need to be paired strategically in order to make ice cream. Extensions: Inquire: Pick a material of interest – Find the melting point, boiling point & freezing point.